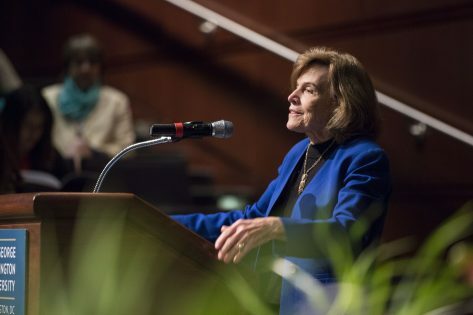 But this year’s Summit proved, as Sylvia Earle has noted, that we’ve learned more about our ocean in the last 20 years than the previous 20,000. The range of cutting edge ocean knowledge gathered for the sixth biennial Blue Vision Summit May 9-11 from scientists involved in coral restoration to an academy-award winning film director, a coastal mayor, a cosmetics manufacturer, the CEOs of the National Aquarium, PADI and Surfrider Foundation and many others including a recently retired Navy Rear Admiral worried about sea level rise were as impressive as the challenges we all face. 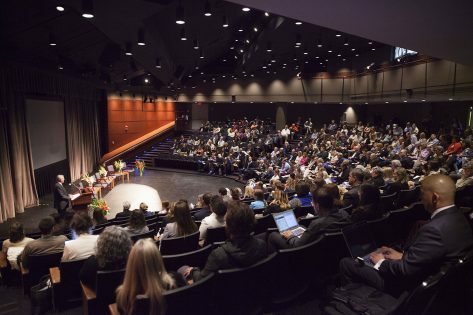 Hoping to turn the tide, hundreds of established and emerging ocean leaders from across the country came together making this year’s summit the youngest and most diverse to date. There’s nothing like an existential threat to get people to school together. Speaking of which we also had students from three Middle Schools in New York take a two-day field trip to D.C. to join us. 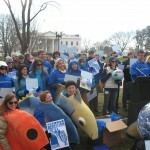 The next day, May 10, we held the largest citizen lobby for the ocean in U.S. history, with delegations from 25 states. 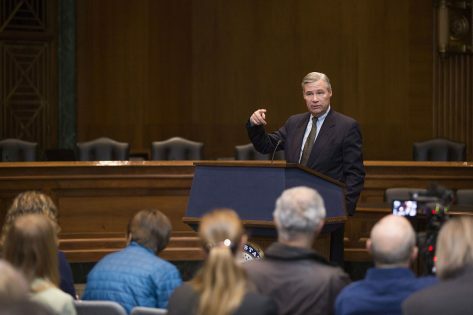 After being greeted by Senator Sheldon Whitehouse of Rhode Island (the ‘Ocean State’) in the Dirkson Senate office building, we held 130 meetings at which, among other things, we spoke out for a bill Menendez, Whitehouse and others have introduced to stop new offshore drilling in the Atlantic, spoke out against drilling in the Arctic and elsewhere and supported full-funding for threatened ocean programs at NOAA, EPA and other agencies. There were also state delegations participating from Colorado, Arizona, Utah, Ohio and Michigan. These states are part of the Inland Ocean Coalition, proving that the health of our public seas – the source of both a vibrant blue economy and half the oxygen we consume – can no longer be seen as a regional or a coastal issue, but has become an American issue of the first order. 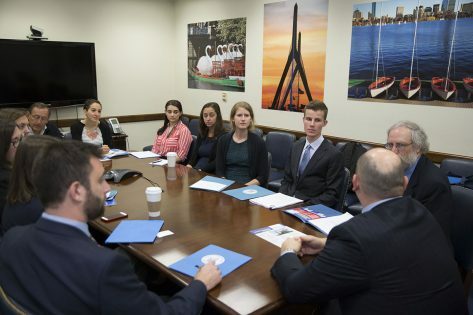 I got to see some of our delegations in action including the Florida team (which held 24 meetings, the most of any state), South Carolina, Massachusetts, Maine and folks from my home waters of Northern California (there was a separate SoCal delegation). I was hugely impressed by everyone’s preparation and presentations to friend and foe alike. “This was a Summit high point for me. Everyone at least once in their life has to experience what its like to go and meet with the people you elect to Congress,” enthused Deb Castellana of Mission Blue. As for effectiveness, let me give just two examples – first this link to a selfie-video Senator Booker made while meeting with the New Jersey delegation. 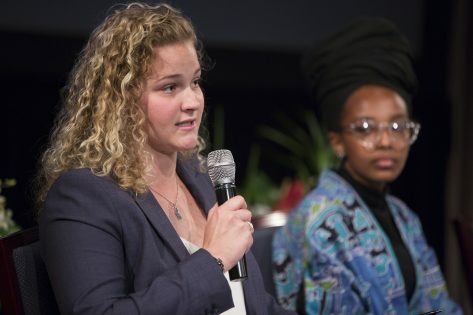 Also ‘Heirs to the Ocean’ a group of 11-13-year-olds were part of the California (and Oregon) delegations where they gave scientifically accurate and impassioned pleas for their generation on a range of issues. 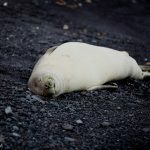 On their return home they received word from Rep. Eric Swalwell’s (D-CA) office that in response to what they’d asked for he’d agreed to co-sponsor the Shark Fin Trade Elimination Act and the Arctic Drilling Ban. But of course I’ve gotten ahead of my story. On the eve of the Summit we held a welcome reception at a D.C. bar, drank like fish, and then went to a nearby theater we’d rented to screen the documentary ‘Chasing Coral’ by Director Jeff Orlowski who was there with us. This deeply cautionary but visually stunning film shows the real-time death of corals on the Great Barrier Reef and around the world that is taking place as a result of climate-linked global bleaching. 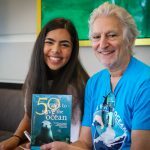 Chasing Coral will screen on Netflix later this summer. For more go to: www.chasingcoral.com In the meantime here’s a link to an article I just wrote about this global disaster for The Progressive magazine. The Summit’s first full day at George Washington University included more than 25 panels, presentations and theme dinners focusing on strategies and solutions to address major ocean issues including offshore oil, plastic and other forms of pollution, ocean acidification, the future of fish and fishing, ocean planning and funding, marine protected areas, sun block safety, how to build up coastal resiliency in the face of rising seas and how to assure our movement reflects the human diversity of our nation and blue planet. 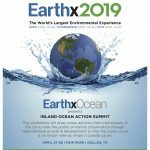 The Opening Ceremony (Keynotes speakers), Ocean Strategy under Trump, the Inland Ocean Panel, Blue Beat journalism Panel, Blue Economy Panel, The Future of the Blue Movement Youth Plenary, and the Ocean Recreation and Conservation panel. With over 25 hours of recorded footage Blue Frontier also plans to have more videos posted soon. The first Summit day finished with theme dinners around the city including the one I attended organized by Writers For the Sea with 20 participants including eight ocean authors. Our second day finished with Hill Day delegations’ debriefing at Mott House near the Capitol followed by a raucous celebratory party sponsored by the D.C. chapter of Surfrider Foundation – a tradition now going back to the founding Summit in 2004. 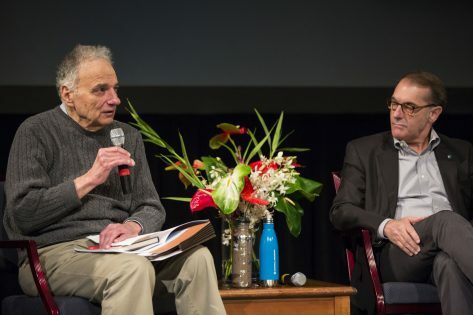 Our third day, Thursday May 11, started with a joint ‘Ocean of Tomorrow’ Symposium with four of this year’s Peter Benchley Ocean Award winners held at the Pew Charitable Trusts. These were scientists Dr. Ussif Rashid Sumaila of the University of British Columbia and Dr. Ben Halpern of UC Santa Barbara, IMAX film director Greg MacGillivary and Fisheries Minister Susi Pudjiastuti of Indonesia who has ordered the sinking of close to 400 pirate fishing vessels caught in her nation’s waters. 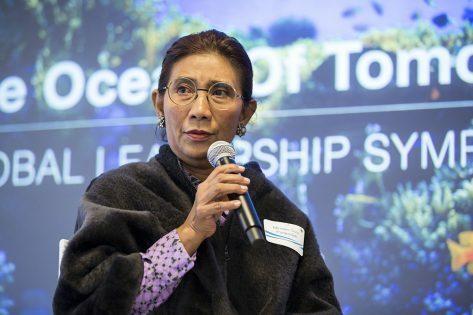 Along with protecting her marine ecosystem and local fishing communities she’s also freed pirate slave crews and illegally captured whale sharks. She’s now calling on other nations to go after IUU pirate fishing for what it is – transnational organized crime. 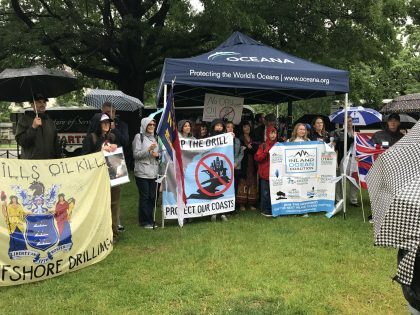 After the symposium some 75 of us held a soggy press conference/rally in the rain at the Department of Interior to call on Secretary of Interior Ryan Zinke to stop leasing offshore oil plots – one of our chants ‘Ryan Zinke Don’t be a tool. You work for us, not fossil fuel.’ Special thanks here to Oceana for bringing a rain tent! 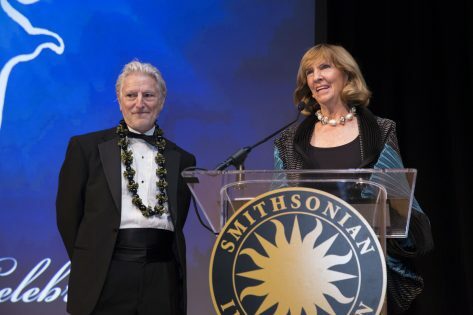 That evening we celebrated a new ‘year class’ among our 77 Peter Benchley Ocean Award winners to date with a spectacular 10th annual awards ceremony and strolling dinner at the Smithsonian Museum of Natural History co-hosted by Wendy Benchley and myself. With the threat posed by the pro-oil, anti-environmental and anti-science Trump administration and Congress it’s important we highlight leaders from across the full spectrum of society who are providing sensible and sustainable leadership and solutions for our blue marble planet. Finally, the Blue Vision Summit could not have taken place without our 38 sponsors and supporters. Here’s your chance to check out their names and logos and get involved with them if you’re not already. You can view them here. 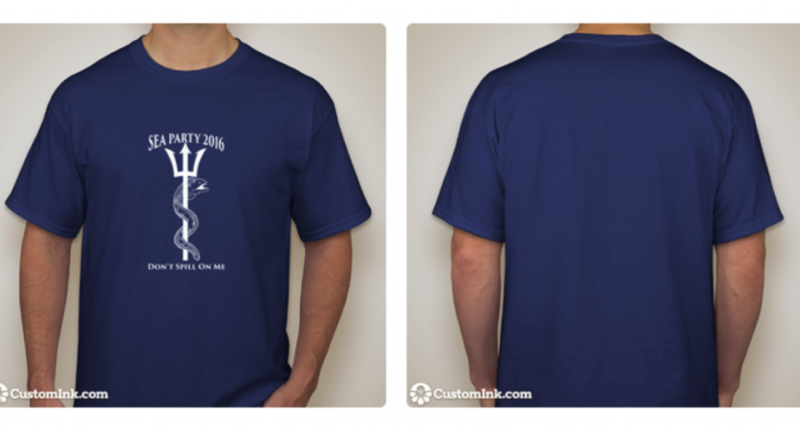 If you attended the Summit and have not submit a feedback form please help us out by filling on out online. 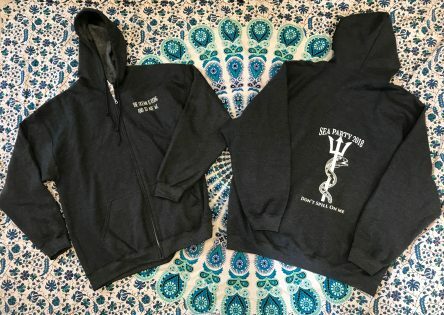 Its short, we promise! You can do so here! Now I don’t have enough space left to acknowledge what else is going on in the next wave of post-Summit resistance. 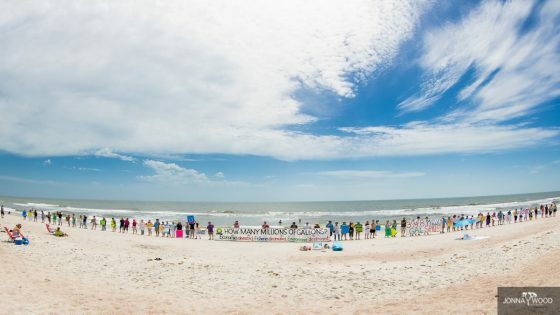 There was Hands Across the Sand on May 20 that saw people taking not to the streets but dozens of the nation’s beaches to oppose offshore drilling and support job-generating clean energy. And then there’s President Trump’s dolphin-hating budget that just came out and that I’ll review in the next Blue Notes. 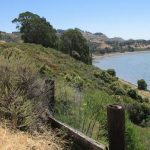 It includes plans to eliminate the U.S. Sea Grant Program and the Marine Mammal Commission. So please don’t be partisan and say this budget is going to hurt a lot of people. It’s going to hurt a lot of species, humans being just one of them. So how do we fight back? 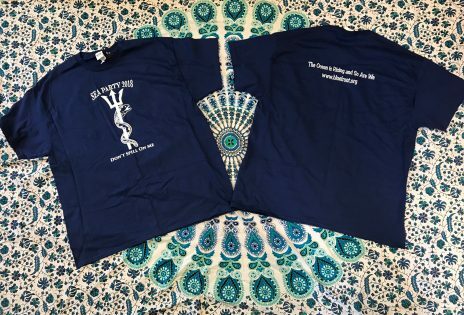 First, buy a Sea Party 2018 T-shirt or Hoodie so you can wear your heart on your sleeve as we begin to build this movement. Sea Party 2018 aims to follow up on our Hill Day by keeping our elected officials accountable. The Sea Party is not a project of Blue Frontier or any single group but an umbrella and a pitchfork to be raised in every town hall meeting or public hearing where the people who are supposed to represent us show up between now and the next election. Stopping offshore oil, rapidly transitioning to clean energy, protecting our blue economy, working waterfronts and ocean communities and ecosystems are not partisan issues, they are issues that speak to the blue in our red, white and blue. We need to make ourselves heard and seen over the next 18 months and that is why we need a Sea Party. Again, thanks to all Summit attendees and seaweed rebels for being part of the salty resistance. 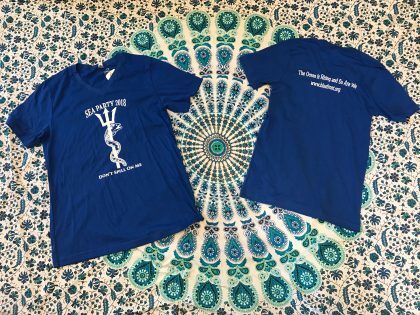 As our reasonably priced T-shirts reads – The Ocean is Rising and So Are We!